Construction is underway on a new 31-story, 300-room Hampton Inn Manhattan Times Square Central, designed by Helpern Architects for a site owned by OTO Development next to the historic Nederlander Theatre, on West 41st Street between Seventh and Eighth Avenues. The brick and limestone tower steps back as it rises. The challenge to provide extra space in handicap rooms led to a unique solution: they are located within softly curved, cantilevered bays at the 7th, 12th, 17th, and 22nd floors – referencing strong horizontal features of adjacent older buildings. At street level, an undulating marquee lit from within invites pedestrians into a recessed entry, flanked by backlit glass panels, that in turn leads to the lobby. “This suggests the allure and presence of a theater entrance with its promise of drama and delight,” Helpern observes. “The design exemplifies Helpern Architects’ ability to give a limited-service hotel the highest-quality architecture,” says Corry Oakes, partner in charge for the South Carolina-based OTO Development. The project is scheduled for completion in early 2015. This is Helpern Architects’ second hotel for OTO Development. 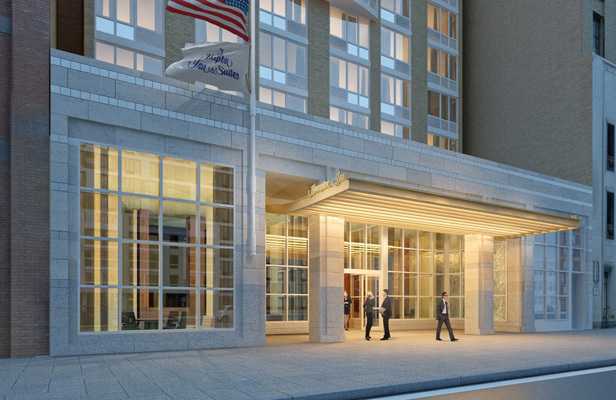 The first, a Marriott Fairfield Inn and Suites on West 33rd Street opposite the current US Post Office, opened this spring.